This year the city of Hamburg (Germany) was the host of the IBA (The International Building Exhibition) and the IGS (The International Garden Show). Both events where situated in the city district of Wilhelmsburg. Wilhelmsburg itself is a river island on the Elbe and has a rich tradition dealing with its surrounding water front. The importance of trade and the closeness of the Hamburg harbor was a major key factor in the economical development of the area. Today, the area is more known for its high unemployment rate and for having a very cultural diverse neighbourhood. To shift that paradigm of begin stigmatized as an area only facing poverty the city of Hamburg saw a good chance to change this image through those two main events. The goals and aims of the IBA had been to focus on the topic “Metropolis of the Future” and to find a strategies for “Growing Cities”. Over 50 projects had been presented. All had good intentions but what will be final result after the IBA and IGA? Can the local community gain something out of this development process. Or will be there a big park resulting from the IGS and some shiny new buildings from the IBA. Well some questions might be asked too early, but some conclusions can already be made. The political will was that the IBA and IGA has to be in 2013, that gave a lot of pressure to the people who had been in charge of the IBA because between the start and the “presentation” year only 7 years were in between. (Normally around 10 years are calculated between preparation and the presentation for such an exhibition). That circumstance was leading to the fact that not all projects had been completed in 2013 or are still under construction. Which makes it very difficult to get a notion for the IBA Hamburg, when some projects are still not ready. The second thing is that, some projects are lacking of its strengthens in fact of the exhibitions character. More showcasing e.g. energy efficient housing than really giving an answer on urgent urban question. How to solve the issue of energy efficiency. 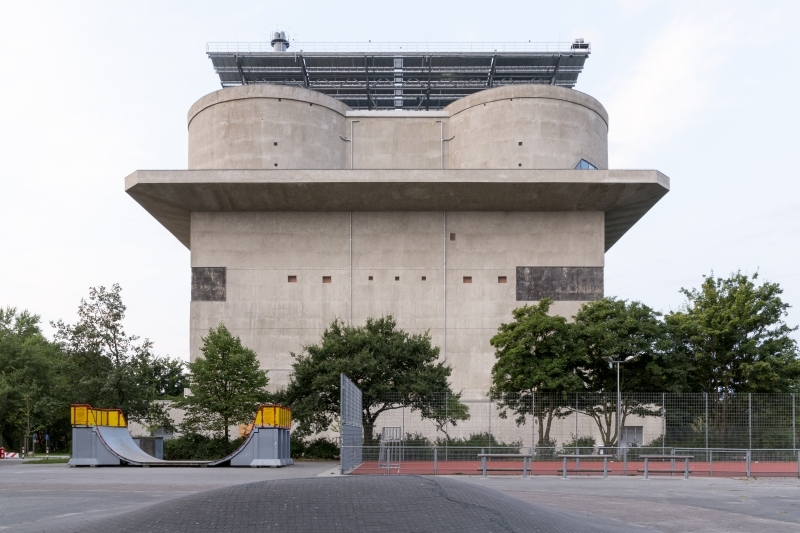 The second is the Energy Bunker (Energiebunker). The 42 meter high, protection and anti-aircraft bunker on the Neuhöfer road was built during the Second World War. Because after the war the concrete block could not be broken without endangering the adjacent residential buildings, the British army blasted only its interior. Externally, the bunker remained almost intact. Since then, the ruin was largely unused and in danger of collapsing in the middle of the residential area. Development began in 2006 with the concept for the conversion of the building as energy bunker. Today its a symbol and a new landmark in the area of Wilhelmsburg. Which is combining the positive shift from a memorial of the Second World War towards a landmark of change in the awareness of Climate change. The Energiebunker also offers visitors of the neighborhood great overview from its platform on the top of the building. For summing up the experience of the IBA Hamburg. The problem of those exhibitions are that they are mainly motivated by a top-down approach. Politicians expect a positive impact on local economy and urban development through such projects. But for solving problems on a local level it needs not mainly such an approach. For claiming of rethinking the “Metropolis of the Future” it needs more projects like the University of Neighbourhoods which is trying to understand the local conditions and translating them into a certain project. Hopefully future IBA’s will take a bottom up approach into account for establishing a user participatory tool in asking and developing “Cities of the Future”.